Crimson AV will demonstrate its new series of VW4600G3 Video Wall Mounts, an adjustable menu board mount, and an all-in-one kiosk solution at Digital Signage Expo (DSE) 2018. Crimson AV's adjustable VW4600G3 Video Wall Mount will accommodate 37-inch to 75-inch displays weighing up to 200 lbs., and offer six points of fine adjustment for ease of alignment. A proprietary one-touch lock and key system makes secure installations quick and easy. Crimson AV's new video wall mount will be shown in Booth 2429 at DSE 2018. Crimson AV will also introduce its latest wall mounted menu board the WML2, which offers even more versatility for its menu boards. With post-installation leveling, tilt adjustments, and in-out fine alignment adjustments, these mounts allow for ease of installation. Finally, Crimson AV will showcase its new KFP Commercial All-In-One Kiosk Displays, specifically designed and targeted for commercial markets. 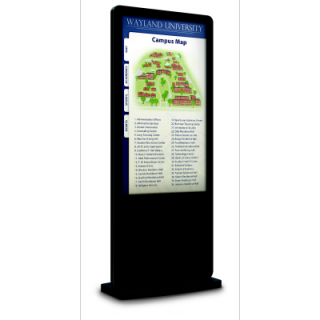 These ultra-slim, sleek-design kiosks offer everything needed in a kiosk, with a variety of options in media players, touch screens, and Windows/Android operating systems. Crimson AV's new KFP Commercial All-in-One Kiosk Display.